On February 18, 1891 the Legislative Assembly of the State of Oregon established and incorporated the Port of Portland to Provide for the Improvement of the Willamette and Columbia Rivers, in said Port, and Between said Port and the Sea. 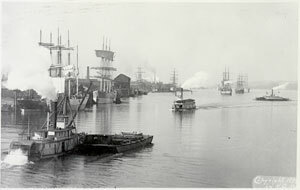 The first task of the new public corporation was to construct and maintain a shipping channel in the Willamette and Columbia rivers. In 1970 that original Port of Portland was merged with the Portland Commission of Public Docks to create the consolidated Port of Portland now responsible for overseeing Portland International Airport, general aviation, and marine activities in the tri-county area consisting of Multnomah, Clackamas, and Washington counties.